21 December 1952 (+) is born in Crawfordsville, United States. 3 August 1978 (x) stabbed in the chest Mark Henry in Terre Haute, United States. 1 June 1980 (x) attacked Ed Healy in Indianapolis, United States. 12 October 1982 (x) handcuffed, severely beaten up and left in a coma Craig Townsend in Lowell, United States. 23 October 1982 (-) beaten and stabbed to death Steven Crockett in Kankakee, United States. 30 October 1982 (-) found beaten and stabbed to death Robert Foley in Joliet, United States. 25 December 1982 (-) beaten and stabbed to death John Johnson in Belshaw, United States. 28 December 1982 (-) beaten and stabbed to death Steven Agan in Newport, United States. 30 December 1982 (-) stabbed to death David Block in Deerfield, United States. 2 March 1983 (-) beaten and stabbed to death John Bartlett in Niles, United States. 4 March 1983 (-) beaten and stabbed to death Edgar Underkofler in Danville, United States. 8 April 1983 (-) beaten and stabbed to death Gustavo Herrera in Lake Forest, United States. 15 April 1983 (-) found beaten and stabbed to death Ervin Gibson in Lake Forest, United States. 9 May 1983 (-) beaten and stabbed to death Jimmy Roberts in Chicago, United States. 31 August 1983 (-) beaten and stabbed to death Ralph Calise in Lake Forest, United States. 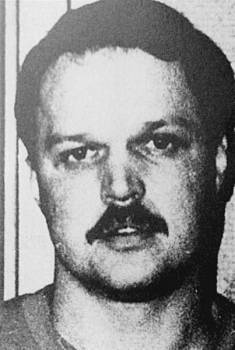 30 September 1983 (x) is arrested by Trooper Kenneth Buehrle in Lowell, United States. 18 October 1983 (x) Four skeletonised victims of Eyler are found in Lake Forest, United States. 7 December 1983 (-) found beaten and stabbed to death Richard Wayne in Clayton, United States. 19 August 1984 (-) beaten, stabbed to death and cut to pieces Daniel Bridges in Chicago, United States. 21 August 1984 (x) is arrested and charged with the murders of at least 15 young men in Chicago, United States. 13 September 1984 (x) Start of the trial against Eyler in Chicago, United States. 3 October 1986 (x) is sentenced to death by lethal injection for the murder of Daniel Bridges in Chicago, United States. 6 March 1994 (-) dies of AIDS in Pontiac, United States.